The Cuisinart CPS-445 is a grilled pizza set. 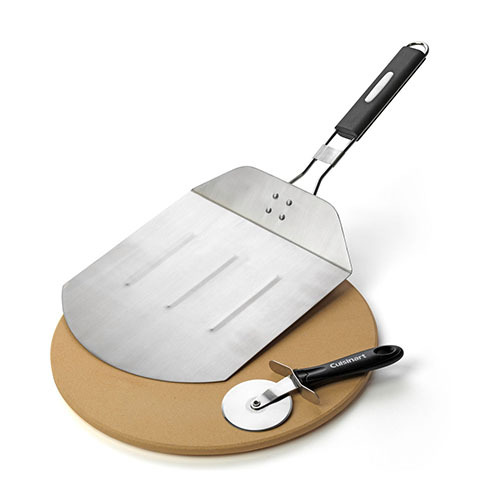 The 3 piece set collection includes a Pizza Stone, Pizza Peel, and Pizza Cutter. Toss the stone on grill and in 15 minutes grilled pizzas will be ready to eat. 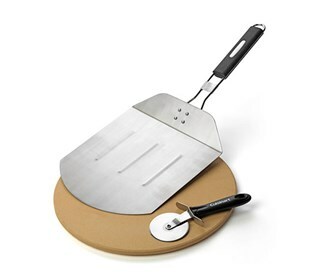 The generous stainless pizza peel is used to move pizzas, and the pizza cutter to serve up a pie in seconds. The Cuisinart Grilled Pizza Pack has many exciting features for users of all types. You can extend the lifetime of your Cuisinart Grilled Pizza Pack with the purchase of a FactoryOutletStore Factory Protection Plan. See the Cuisinart Grilled Pizza Pack gallery images above for more product views. The Cuisinart Grilled Pizza Pack is sold as a Brand New Unopened Item.